From Robert D. Kaplan, named one of the world's Top 100 Global Thinkers by "Foreign Policy" magazine, comes a penetrating look at the volatile region that will dominate the future of geopolitical conflict. Over the last decade, the center of world power has been quietly shifting from Europe to Asia. With oil reserves of several billion barrels, an estimated nine hundred trillion cubic feet of natural gas, and several centuries worth of competing territorial claims, the South China Sea in particular is a simmering pot of potential conflict. The underreported military buildup in the area where the Western Pacific meets the Indian Ocean means that it will likely be a hinge point for global war and peace for the foreseeable future. In "Asia's Cauldron," Robert D. Kaplan offers up a vivid snapshot of the nations surrounding the South China Sea, the conflicts brewing in the region at the dawn of the twenty-first century, and their implications for global peace and stability. One of the world's most perceptive foreign policy experts, Kaplan interprets America's interests in Asia in the context of an increasingly assertive China. He explains how the region's unique geography fosters the growth of navies but also impedes aggression. And he draws a striking parallel between China's quest for hegemony in the South China Sea and the United States imperial adventure in the Caribbean more than a century ago. To understand the future of conflict in East Asia, Kaplan argues, one must understand the goals and motivations of its leaders and its people. Part travelogue, part geopolitical primer, "Asia's Cauldron" takes us on a journey through the region's boom cities and ramshackle slums: from Vietnam, where the superfueled capitalism of the erstwhile colonial capital, Saigon, inspires the geostrategic pretensions of the official seat of government in Hanoi, to Malaysia, where a unique mix of authoritarian Islam and Western-style consumerism creates quite possibly the ultimate postmodern society; and from Singapore, whose benevolent autocracy helped foster an economic miracle, to the Philippines, where a different brand of authoritarianism under Ferdinand Marcos led not to economic growth but to decades of corruption and crime. 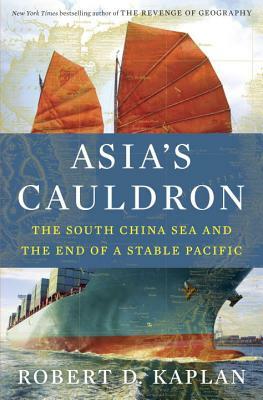 At a time when every day's news seems to contain some new story large or small that directly relates to conflicts over the South China Sea, "Asia's Cauldron" is an indispensable guide to a corner of the globe that will affect all of our lives for years to come. "Asia's Cauldron" is a short book with a powerful thesis, and it stands out for its clarity and good sense. . . . If you are doing business in China, traveling in Southeast Asia or just obsessing about geopolitics, you will want to read it. "The New York Times Book Review"
Kaplan has established himself as one of our most consequential geopolitical thinkers. . . . "Asia's Cauldron"] is part treatise on geopolitics, part travel narrative. Indeed, he writes in the tradition of the great travel writers. "The Weekly Standard"
Kaplan's fascinating book is a welcome challenge to the pessimists who see only trouble in China's rise and the hawks who view it as malign. "The Economist"
Muscular, deeply knowledgeable . . . Kaplan is an ultra-realist who] takes a non-moralistic stance on questions of power and diplomacy. "Financial Times. Robert D. Kaplan is the bestselling author of sixteen books on foreign affairs and travel translated into many languages, including "Asia s Cauldron, The Revenge of Geography, Monsoon, The Coming Anarchy, "and" Balkan Ghosts." He is a senior fellow at the Center for a New American Security and a contributing editor at "The Atlantic, " where his work has appeared for three decades. He was chief geopolitical analyst at Stratfor, a visiting professor at the United States Naval Academy, and a member of the Pentagon s Defense Policy Board. "Foreign Policy" magazine has twice named him one of the world s Top 100 Global Thinkers."